home of Rhye's creations for Sid Meier's Civilization series. Among all the history games, Civilization has always been the most customizable, thus is materially a tool for creating great scenarios and mods you can download. This site offers plenty of info on scenarios, maps and full mods made by Rhye for free. You can contribute to expand the strategy guides, editing our wiki. After a long stop, develompent of RFC is again going forward. New screenshot have been added in the Civilization V RFC gallery. A new screenshot has been added in the new RFC page in Civilization V menu. First screenshots of RFC for Civilization V! Here and here and here. New page for mods for Sid Meier's Civilization V.
Please take a look at RFC Fast, a promising speed enhancement that needs some testing. The final patch of RFC (including multiplayer and RFC RAND) has been released. Download here. Do you want to create your own scenarios based on RFC? Now you can! While the new RFC patch is entering beta-test, there's an interesting succession game going on (RFC RAND as Russia). Mac users: if you updated BTS to 3.19, you should install a patch, available in the downloads page to fix some issues. Rhye's and Fall of Civilization is now 4 years old! On April 14th, 2006 the first alpha was released. March 23, 2010: Apparently RFC is already in Wikipedia with a english, spanish and russian page. Please help improving these articles (in particular, adding references) or adding new languages (and linking them to the others). Today's game on livestream will take place at 19:00 GMT (playing as America). Yesterday a RFC game as the Romans has been recorded on livestream. There is going to be another game on March 6th. Stay tuned. At last, FTP is working again and these pages can be updated. Among the latest news, the release of several interesting modmods, such as playable Celts, Phoenician, Hellenism and more. You can reach the forum threads from the modmods wiki page. Checkout the new version and the updated FAQ of the Boardgame. RFC is on YouTube! Walkthroughs are being posted by a user. Japanese and Babylonian guides so far. New screenshots of Rhye's and Fall of the Greek World available. You can now keep track of the project status of Rhye's and Fall of the Greek World. A new project is underway: Rhye's and Fall of the Greek World, which will be the sequel of Greek World, featuring RFC concepts but focusing on the Ancient Age. Its new forum is already up! Version 1.26 of RAND was released yesterday. The new version of RAND will be out this Sunday. As a couple of testers are needed as soon as possible, if you are interested reply on Facebook or on our forum. A new wiki page now summarizes all the current RFC challenges. If you want to test your skills, make sure to check it out. A new patch is out! Six months of bug fixes and improvements rolled into a single update. Download links here. Questions & Answers page on RFC: the Boardgame has been updated. The search button has been improved: now results will show only a selected amount of content, which is mostly civ-related. The updated RFC: the Boardgame reference sheet is now available for download. RFC (including MP and RAND) is now updated to BTS 3.19. Download here. Works on updating RFC to the new BTS 3.19 patch will begin shortly. A unofficial conversion of RoC to Play the World was released. Available now in the Civ3 downloads page. In case you haven't, please take a look at the new poll in our forum. Your vote, too, will count for deciding the next project! All the old strategy articles have been merged with the new ones. Now, the new wiki is a complete database of info, and the old one can be abandoned. One final thank you to all the contributors, and to Talkie Toaster, who had this wonderful idea and carried the management on for the first months. The migration of RFC: Europe info pages from the old wiki has been completed. The migration of Rhye's of Civilization (civ3) strategy guides has been completed. Many thanks to FireFoxer. The civ3 section of this site is finally complete. That includes Rhye's of Civilization gallery and teaser. Looking for RFC-related strategy spoilers? Have a look at the real stability maps. Wiki account registration enabled again, as it is now protected. Wiki account registration has been temporarily disabled, due to the massive amount of spam. Some news for Civ3 users: a new unofficial modification of Rhye's of Civilization is out. It adds Poland and Tartars. Find out more about RFC: the Boardgame in Episode 26 of Apolyton ModCast! Added a review of Sid Meier's Civilziation: the Boardgame as well. Released the updated reference sheet of RFC: the Boardgame. Many thanks to Jeelen. Released a new version of RFC: the Boardgame. Added screenshot galleries for RFC and RFC RAND. Your own submissions for RAND are welcome! An update for Rhye's and Fall of Civilization Multiplayer was released. It fixes a bug that was preventing it from loading. Great works are underway. As you can see, this site is becoming bigger, and will offer new content for you visitors, especially for the ones looking for tips on RFC. For this reason, the wiki has been moved inside the site. Many thanks to Thunderfall and to friends from sites about Guadagno Forex and Project Management. Rhye's and Fall RAND available now! The Rhye's and Fall RAND forum has been created. Release date is July, 28th. Have you got Sid Meier's Civilization: the Boardgame? Then you have to try Rhye's and Fall of Civilization: the Boardgame! Rhye's and Fall of Civilization is now 2 years old! The first alpha release, posted on April 14th 2006, is now available again for download. Rhye's and Fall of Civilization was reviewed in the last issue of "Cyberstrat�ge", a French PC gaming magazine, and was rated 9 out of 10, the best score among the mods shipping with BTS. Rhye's and Fall of Civilization was reviewed in the August issue of "Giochi per il mio Computer", an Italian PC gaming magazine, and was rated 5 out of 5. GameFlood contest is over, and the Earth map won the 1st prize!!. RFC wasn't in the top three mods, but that doesn't matter: that's because the rules said that one person can't win more than one prize. Thank you everyone for your votes! Rhye's and Fall of Civilization was defined by the American actor and journalist Tom W. Chick "one of the most exciting and robust mods ever seen for any game". Here you can find the summary of the information that has been released on RFC for Beyond the Sword. The site is back online! It has moved back to civfanatics.net domain, and is now updated and reorganised. Just in time for announcing that Rhye's and Fall of Civilization will be included in the upcoming expansion pack for Civilization IV, Beyond the Sword! Visit the new wiki! Your contribution is welcome. Happy 2007! The site has been updated with the links to the support sites, including the ones provived by the Russian community. Rhye's and Fall of Civilization hits version 1.00! The final name of the Catapult project is Rhye's and Fall of Civilization. We have a whole forum now, visit us here! Translators needed! We need one person for each of these languages: French, German, Spanish, to localize some text for Catapult mod. Welcome to the new site! As you can see, it now covers all Rhye's mod, rather than just Rhye's of Civ (whose section has been reduced). Remember to bookmark the new page! The new thread has been opened! In the meantime, the site will be on the works. It will probably be moved to a new domain. At any rate, expect news soon. "So, this 2005 has gone by and we had a lot of fun with RGCs, which are now finished. This was possible thanks to the huge effort we made all through 2004 in designing Rhye's of Civilization. I still don't know what kind of year 2006 is going to be. Indeed, there is a project of updating the mod to Civilization IV. It may be very different from the Civ3 mod, as Civ4 already is a nearly perfect game and doesn't require many tweaks, and on the other hand, it offers many new modding possibilities through Python scripting. Anyway, next RoC destiny is tied to the continuation of my job with Firaxis. The situation will be more clear in the following months. For now, have an happy new year!" October 26, 2005: New Civilization IV section opened. October 24, 2005: RGC4 (the last Rhye's of Civilization Goal-based Challenge) release date announced. September 16, 2005: RGC4 announced. It will probably be the last challenge, so don't miss it! August 21, 2005: RGC3 results posted. July 11, 2005: RGC3 has begun! July 1, 2005: RGC2 results posted. June 26, 2005: RGC2 deadline extended to June, the 30th. June 17, 2005: RGC3 title has been revealed. May 20, 2005: RGC2 has begun! May 14, 2005: There are some news in the MC page. Be sure to check them out. 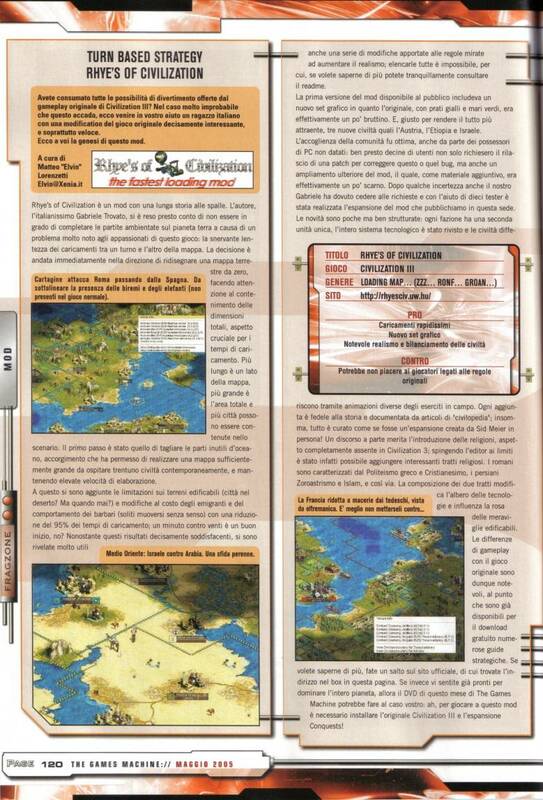 April 29, 2005: The mod received a full page review in the May issue of The Games Machine, an Italian PC games magazine. February 26, 2005: Posted a new strategy guide (The Mongols). February 25, 2005: Updated the multiplayer BIQ. The old one featured revealed map by mistake. Please download it again. February 22, 2005: Rhye's of Civilization Monthly Challenge (a sort of Game Of The Month, based on RoX) will start on March 1st! February 15, 2005: Multiplayer version uploaded. February 13, 2005: Our thread was closed because it was too big and was slowing down the forum. Please visit the new one from now on. February 12, 2005: Posted three new strategy guides (America, Ethiopia, Egypt). January 31, 2005: Posted a new strategy guide (The Germans). January 28, 2005: Posted a new strategy guide (The Byzantines). January 16, 2005: Downloads pages updated. Now a single installer of the Expanded version is available. January 15, 2005: added some screenshots. Released updated "No Byzantines" alternative version. January 14, 2005: released basic version v2.69 and Expansion Pack update v1.23. January 12, 2005: The website is updated by Rhye; the teaser is now completed. December 29, 2004: released basic version v2.68 and Expansion Pack update v1.21. December 25, 2004: released "No Byzantines" alternative version. December 24, 2004: released basic version v2.67 and Expansion Pack update v1.2. December 23, 2004: The second Civ-specific guide for RoCX was posted. Added the FAQ page. December 20, 2004: The first Civ-specific guide for RoCX was posted. December 14, 2004: released Expansion Pack update v1.1. December 11, 2004: released version 2.66 and updated the Generic Strategy Guide. December 9, 2004: posted the Generic Strategy Guide by Enkidu Warrior. December 5, 2004: released Expansion Pack update v1.01. December 4, 2004: the Expansion Pack is out! November 30, 2004: Expansion Pack hits beta! Official release date: December 4th. November 29, 2004: released version 2.65. September 16, 2004: released version 2.62, including updated "Random map" version. September 15, 2004: The whole mod was divided in four parts: an easier way to get updated. August 31, 2004: released version 2.61, including updated "Random map" version. August 30, 2004: posted the interview! August 27, 2004: fixed a couple of bugs in the "Random map" version. August 25, 2004: released version 2.60, including updated "500 turns", "Random map" and "Sumeria" alternative versions. August 16, 2004: released version 2.51, including updated "500 turns" and "Random map". August 14, 2004: posted a new strategy guide by Horton. August 12, 2004: released version 2.50, including updated "500 turns" and "Random map". August 9, 2004: posted a new strategy guide. Today this site is reaching its peak: more than 500 daily visitors!. August 8, 2004: released version 2.49, including updated "500 turns" and "Random map". August 7, 2004: added the "Future projects" page. August 5, 2004: added 5 new strategy guides; updated the "Random map" version. July 28, 2004: added 4 new strategy guides by Horton; updated the links page. July 27, 2004: released version 2.48, including updated "500 turns" and "Random map". July 22, 2004: posted some strategy guides. July 17, 2004: released version 2.47, including updated "500 turns" and "Random map". July 11, 2004: uploaded an updated "Random map" version, with some bugs fixed. July 10, 2004: released "500 turns" and "Random map" versions. You can download them from Rhye's alternative versions page in the downloads section. July 6, 2004: released version 2.46. July 4, 2004: released version 2.45. June 23, 2004: released version 2.4. June 22, 2004: you can send your savegames if you want to see them in the High Scores table. June 8, 2004: Second version of the site. June 3, 2004: We are online!.